Consumer Reclaim has now been pursuing mis sold Solar claims for the better part of 2 years. Being industry leaders in new claim types can be tough. We have had to help guide our clients through a lengthy process in order to begin seeing some results for mis-sold solar claims. Finally, our hard work is paying off and our clients are receiving the benefits. Mis Sold Solar Media – Why Now? We expect that Solar claims will receive plenty more coverage in the coming months. In just the last few weeks we have finally seen some movement from the Financial Ombudsman Service (FOS) with regard to decisions on Solar claims. After having cases sat with them for nearly 18 months it is welcomed following a lengthy period of frustration for our clients. Not surprisingly, the article published by the Daily Mail has come at the same time that Consumer Reclaim has begun to receive an influx of offers for our clients. We are currently running a number of claims against the 3 main Lenders involved: Barclays, Creation and Shawbrook; and our clients are now receiving meaningful settlement offers. 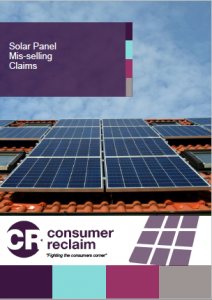 It is also worth noting that there are many other Lenders involved with mis sold solar – Consumer Reclaim will look to take on a case against any Lender where there is a valid claim. Our experience in dealing with other claims that have similar characteristics to mis sold Solar allows us to provide expert advice to our Clients. The first offer made will never be the best offer. Unfortunately, other companies that lack this experience will likely be jumping the gun in accepting them; to the detriment of their clients. For more information about mis sold Solar claims click here. At Consumer Reclaim, we fight to get you the best offer possible when it comes to mis sold Solar. If you have Solar Panels installed and feel that you were mis sold, we can help. We can pursue claims with a settlement that involves you keeping your solar system as well as having it removed without charge. Now could not be a better time to start your claim as we begin to see the main Lenders admit liability. Get in touch with us today and begin your journey to the compensation you deserve. Did you pay more than £100 on a Credit Card or by Finance arranged through the Solar Company? Was your solar PV system installed in the last 6 years? Have you contacted the solar company or the lender to complain? Is the Solar company still in business? Your Reference Number (You only need to fill this in if you have received a letter off us)You can find your unique reference number in the Solar PV letter we have sent you.